Staff lead Pony or Horse Ride any age!! Heberle's has been safely doing carriage rides for over 30 years. We offer 3 different carriages. 2 are called a Vis-a-Vis. With a design of almost 400 years old, the Vis-A-Vis Coach derives its name from the French. The coach is a fine example of craftsmanship turned out by the hands of the master coach builders. The carriages hold 4 people. The 3rd carriage is a wagonette which hold 10 people. Our coach horses are a registered team of well trained, experienced and cared for Belgian or Percheron horses. The coachman is formally dressed in coachman attire consisting of a black top hat, tall boots, breeches, and a tuxedo tailed coat. 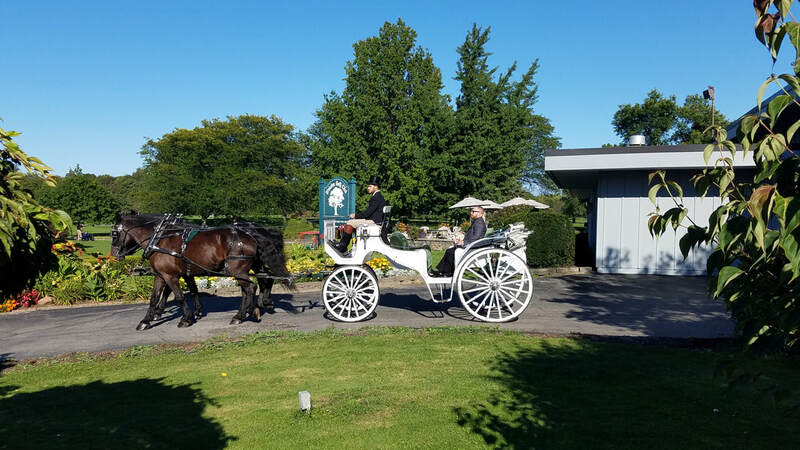 The options for events to use coach carriage rides are unlimited from weddings, Christmas parties or quiet summer rides through Ellison Park. You may decorate the coach with sign on the back. We do private rides through Ellison park (Up to 4 people). Please e-mail Heather@HeberleStables.com for pricing and availability. The price for a wedding (or for the coach to travel to any location) is $600 the first hour and $250 each additional hour. An invoice will be emailed to you as well as the contract. A $50 nonrefundable deposit to hold the date and time. A late fee of $50 will be applied if not paid by date of service. If the weather is bad and you'd like to cancel, please call 4 hours prior to arrival time at 654-9027 or 317-7275. Payment will be refunded excluding the deposit if canceling due to weather. The balance is due prior to service. No credit cards. Cash or check only. Bill Heberle - President and third generation owner of Heberle Stables. Master coachman and head trainer of the draft horses. Will Heberle - Fourth generation of Heberle Stables. Coachman, trail guide, and assistant trainer of draft horses.